Shields seem to have been used universally by all warriors. From the first to the tenth century round shields seem to have been the norm, being either flat or 'watchglass' shaped in cross-section. They are always shown with a boss and often have wooden or metal bands on the back to strengthen them. All the examples found have been of planked construction although there is some evidence to suggest a plyed construction would make the 'watchglass' shape easier to make. Some shields were edged with a rim of sewn thick leather or hide to strengthen them whilst others were possibly faced with leather or rawhide. However none of the shields excavated demonstrate this even though 'leather covered' is a phrase writers used from that period. The Romans had leather shield bags / covers to protect them from the elements, and were fairly elaborate with specially sewn parts in the shape of the boss, and their unit symbols on them. Perhaps a version of these was what the chroniclers meant. Late Roman shield finds, the shield from Nydam and a fragment from the Isle of Man all have paint applied directly to the wooden surface. Traditionally shields were made of linden (Lime) wood although other timbers may also have been used such as Alder and Poplar. These timbers are not very dense and are light in the hand. They also have a characteristic in that they are not inclined to split unlike Oak. Also, the fibres of the timber bind around blades preventing the blade from cutting any deeper unless a lot more pressure is applied. Round shields seem to have varied in size from around 45 - 120cm (18" - 48") in diameter but the smaller and more manageable 75 - 90cm (30" - 36") is by far the most common. 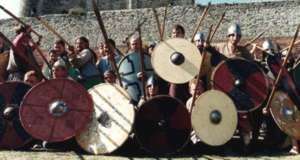 The smaller shield sizes come from the pagan period for the Saxons and the larger sizes from the 10th and 11th centuries. 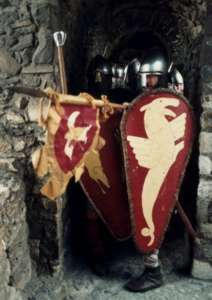 By the beginning of the eleventh century the bottom edge of the shield evolved downwards to cover the upper leg giving rise the kite shield. There is evidence for both flat and curved kite shields, with the curved being most likely, and most having bosses. It is debatable whether or not these bosses were used in the same fashion as round shields; i.e. centre gripped. The tendency in re-enactment is to wear them crossbraced, as if you were still riding. This is because if the shield is held near the boss, the lower section acts like a pendulum making it difficult to operate. The Kite shield seems to vary between 1.0 - 1.5m (3'6" - 5') in length with about 1.2m (4') being the commonest. Most shields are shown in illuminations as being painted a single colour although some have a design painted onto them; the commonest designs are simple crosses or derivations of sun wheels or segments. The few round shields that survived have much more complicated designs painted on them and sometimes very ornate silver and gold work applied around the boss and the strap anchors. 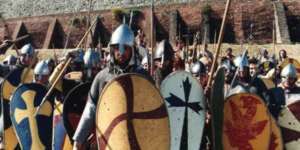 The shield wall at the battle of Hastings was to all intense purposes solid and impenetrable, even to the hardiest cavalry rider and horse. 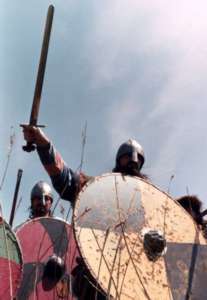 The Saxons were very numerous, semi professional if not professional troops who were not fazed by seeing the enemy. They had chosen a good spot on top of Caldbec Hill making any attack have to work it's way up the hillside. Even the cavalry charges had lost steam by the shield wall, but the crucial thing was that there was no chance for them to penetrate those defences. The men were perhaps ten deep in places, and no horse will even accidentally break through. Moreover, the rider would certainly come to grief as well. All those spears projecting out of the wall would have meant instant death. So William's men had only one option, and that was to ride shield side facing the wall, and lob their javelins into the seething mass. It didn't matter whether they hit a body as long as they hit something, and there was plenty to hit. The momentum of the horse now moving along the line from left to right as you look up the hill, on fairy level ground meant the they hardly needed to throw the javelins. However, if they made the slightest mistake, then the shield wall would have them for breakfast. Having traversed the wall and avoided all of the missiles that were returned, they then had to return to the bottom of the field to 'reload' with another javelin. Having rested to catch their breaths, it was time to sally back up the hill and relive the excitement of the previous trip. All of this eventually ground down the Saxons, as they were unable to come into actual contact with William's cavalrymen. The Bayeux Tapestry bears out all of these points, and the interesting thing is that the French never learned this lesson themselves, much to their cost at Crecy, Agincourt and Poitiers. Ignoring the enormous part the bow made, the key thing is that they were attacking troops 'dug' in with lots of spears projecting out of the wall. Shields played little in the English foot soldiers equipment at that point, but the essence is the same. When the cavalry slowed down as they had to, to negotiate the spears, wooden spikes and pits, they fell vulnerable the cohesiveness of the 'wall'. The English also had to learn this again at the battle of Bannockburn, where the Scottish 'schiltron' performed the same way as the English walls had done. Incidentally, the round shield makes a good umbrella, a fair mess table, and a dry place to sit. The Bayeux tapestry once again shows an aspect of this in a scene with troops eating off their kite shields that have been placed on what may be a knock-down table frame. Practical tests have shown that lime wood shields are naturally very good at absorbing blows and resist splitting, and they are particularly good at trapping spears when you parry with them (the Saxons sometimes referred to the shield as a 'net of spears'). The spears of this period, sharp as they were, would remain stuck in a shield if even a moderate thrust was caught. However, a spear stuck in your shield renders the shield fairly ineffective, but also can render the spear useless to you, so most attacks would have been fended aside using the edge of the shield. After all, it was the owner you had to hit.